In 1768 when Admiral Louis de Bougainvillea began his long journey to the Pacific Ocean and discovered the vine that now bears his name, it was a botanical highlight of the voyage. Through the ensuing years, this Brazilian beauty has assumed its rightful place as one of the most popular, spectacular and beautiful tropical plants. 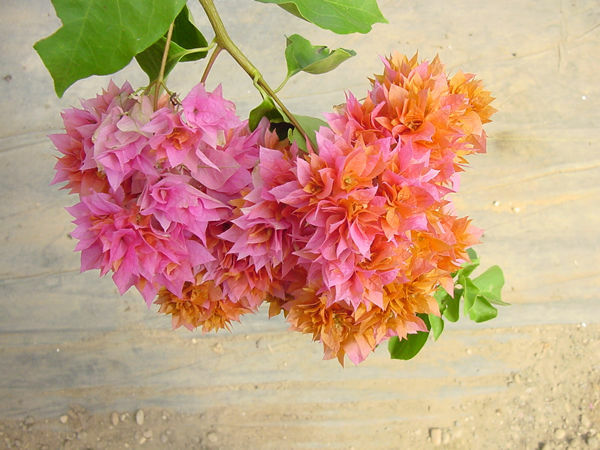 The modern day hybrids of Bougainvillea spectabilis (B. Brasiliensis) and B. glabra are among the most beautiful of flowering vines. These tropical members of the Nyctaginaceae (Four-O'Clock) family, are very vigorous, evergreen,woody vines with spines. The plant is unusual in several respects: it is sterile and propagated only from cuttings, does better in pots than in the ground, and rewards our neglect with abundant beauty. It bears no seeds, but mutates often, resulting in many varieties. Grown either as a shrub or climbing vine, it can summer on terraces, patios, decks, or at pool side. Although normally climbers, they can be trained to stay bushy as pot plants, hanging baskets, or as standard 3 or 4 feet high. They will bloom beautifully on branches on 18"-20" long. Keep all long shoots cut back to 18"-20" for best bloom. The vibrant color of this vine comes not from the small white tubular flowers, but from the 3 large paper-like bracts that surround each flower. They grow readily from cuttings 4"-6" long, and in 4-6 weeks will develop good root systems when given bottom heat and mist. When well rooted in perlite/peat moss mix, they can be potted in small containers in a soilless mix with added pine bark to give more drainage. Care should be exercised in transplanting since the fine roots often do not knit the soil together in a firm root ball. When repotting annually, slice off the outer 1"-2" of the root ball, and repot in the same size container. Bougainvillea need very bright light (2,500 fc) and do well in full sun. These vines typically lose some leaves for a short time during the winter, but when light conditions are low, leaf loss may occur at any time. Under high light conditions, the colorful bracts will adorn the plant almost constantly and will persist for weeks. 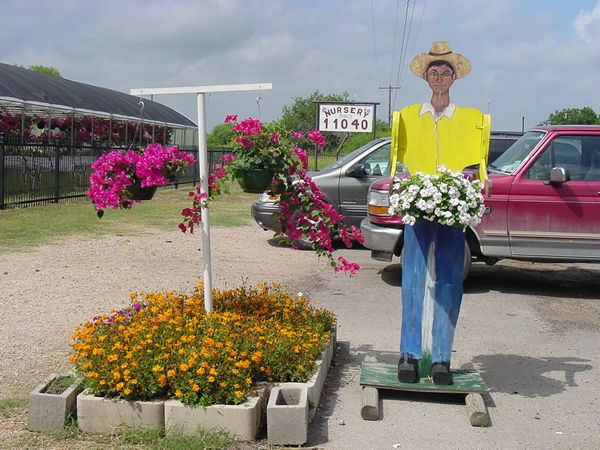 Planting in the ground in San Antonio is not recommended because of the winter damage which will result, and the fact that our soils are too rich and we receive too much rain. In the ground, the plant will stay vegetative and bloom little. A better option is to "plant" the potted bougainvillea plant in the landscape so the root system will be inhibited. Continuous pinching of the tips of the new shoots will encourage branching. The plants can be cut back to 12 inches in the spring and fall and encouraged to make new growth. They bloom on new growth, so try to make as many new growth points as possible by a pinching often. In a hanging basket or other container, try at all costs to avoid the long 6 foot shoots by pinching often. After pinching, if the night temperatures are at least 70 degrees F., bloom can be expected in about 50 days. 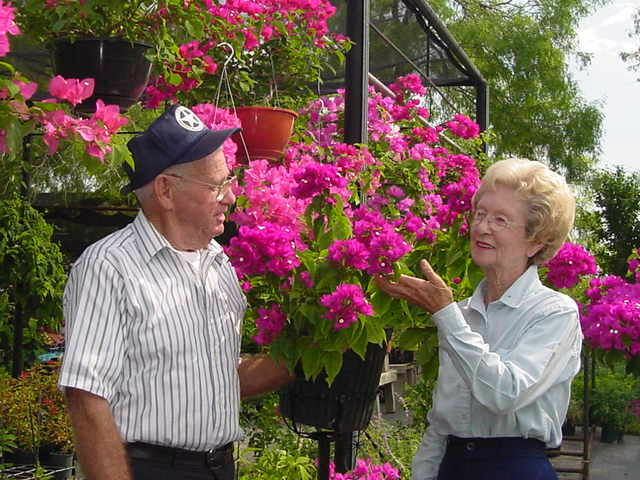 In late fall, you will have to make arrangements to protect your bougainvillea from cold temperatures (below 40 degrees F.) If you have a greenhouse, move it in when the 40 degree F. temperatures arrive. The tropical blooming machine will be colorful all winter if you keep the greenhouse temperatures between 50 degrees F. And 110 degrees. F. If you do not have a greenhouse, move the bougainvillea into the house or insulated garage. The plant has thorns and can be difficult to store unless it is pruned back to 6- to 8-inch stems. Phil Hovey recommended that you tie up the stems for storage rather than do the severe pruning in the fall. The tying tactic reduces the tendency for the plants going into storage to put on a flush of growth. Hovey does his pruning in March when he moves the plants back out into the nursery. Every two years, or when you notice a diminished performance, consider repotting bougainvilleas. Remove the root ball from the container, select a sturdy knife, and cut a one inch strip all the way around the ball. Toss the trimmed strip into the compost pile, replace the root ball in the container, and fill the container with new potting soil. These vines are heavy feeders and respond best to constant (daily) feeding with one-half strength water soluble fertilizer, e.g., Peter's 20-20-20, Excel 21-5-20, Miracle Grow or Rapid Grow. With high light and constant feeding, the plants will bloom at least 11 months of the year. Straight hibiscus food has also been a very successful fertilizer. These plants are salt tolerant so constant fertilization will not create a problem. These plants flower best under stress. Keep the plant slightly on the dry side, and allow the plant to become root bound. In containers they should be watered frequently so the soil feels nicely moist but never soggy. Water thoroughly, then allow to become moderately dry between waterings. They respond extremely well to stress, such as drought and heat, and reward you with excellent bloom. Even with a tolerance for drought, however, you end up watering plants nearly every day because of the small root system. Irrigate enough at each watering so that the water comes through the drain holes in the bottom of the container. The blooms as we know them are not true flowers, but are 3 large papery bracts that encircle small, white, tubular inconspicuous flowers much like the poinsettia. 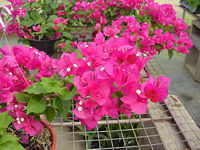 Some of the best bougainvilleas to look for in your local garden centers are: white and lavender 'Dr. 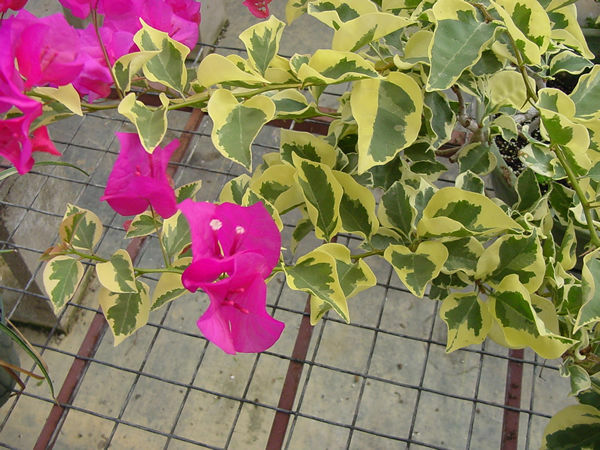 Barry',, and its gold and green leaved variegatedfrom 'Vickie', the dark pink flowers of 'Juanita Hatten', and its new mutation with green leaves spatter painted with gold. 'Barbara Karst' Bright red to bluish crimson in shade, blooms very young, likes heat. 'Sundown' Apricot color, vigorous, good bloomer, heavy feeder. 'Hawaiian Torch' fuchsia, with compact bloom arranged around a spike. 'Texas Dawn' smaller pink flowers, in huge clusters, vigorous, keep cut back. 'Double Pink' clear pink, vigorous, keep trimmed back, spent flowers must be cut off since double flowering types will not shed flowers in the typical fashion. 'Surprise' large, clear pink-white bi-color flowers, easy bloomer. Excellent! 'Royal Purple' the most striking purple flowers on the market, easy bloomer. Plants do best in large (5-10 gallon) clay containers if grown outdoors (clay containers tend to stay drier, thus stressing the plants) or in large handing baskets. 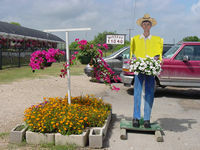 The 10" basket is the commercial standard, but plants will do much better in 12" hanging baskets. Place the containers in full sun, or in a place where they will receive at least ½ day of full sun. 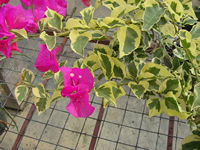 If your bougainvillea is not blooming, it probably is not receiving enough sun or fertilizer. These plants thrive in the tropics in areas of low rainfall and intense sun and heat. 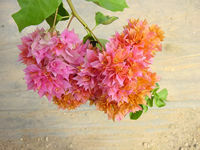 Any well drained pottingsoil mix is suitable for growing Bougainvillea. 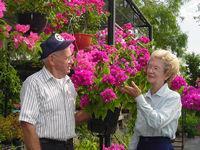 Hatten's Nursery in Mobile, Alabama, world famous bougainvillea growers use a mix consisting of 4 parts of well rotted pine bark, 3 parts peat moss and 2 parts of coarse perlite. To about 5 gallons of this mix add ½ cup of Osmocote and 2 tablespoons of 19-5-9 slow release lawn fertilizer.